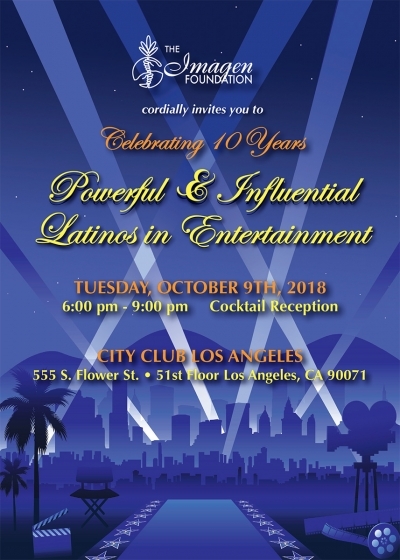 Join the Imagen Foundation for the 10th Annual Powerful & Influential Latinos in Entertainment cocktail reception, where we celebrate the accomplishments of some of Hollywood’s most prominent movers and shakers. For questions, contact the Imagen Foundation at (626) 376-9751 or email info@imagen.org. Online ticket purchases for this year's Powerful & Influential Latinos in Entertainment is now closed. If you would like to attend, tickets will be available for purchase at the door. The event will be held at the City Club Los Angeles starting at 6pm. See above for address and details.